Design heft and art world gravitas are giving the City by the Bay a new patina. Ever since the Gold Rush, seekers have been lured to San Francisco by possibility. The 49ers of the 1800s came in search of fortune and adventure. In 1967, flower children descended upon Haight-Ashbury during the Summer of Love. Now, trailblazing entre- preneurs of the tech economy are reshaping the modern world from their command posts in Silicon Valley. I came to San Francisco a decade ago, arriving with little more than a backpack and a cardboard box of essentials. Like so many other transplants, I felt confident—or foolishly hopeful, at the very least— that life would somehow shake into place here. It didn’t take long to learn that many of my preconceived notions were skewed. The gorgeous California coastline is constantly cloudy, and as such the city feels at times more like a sleepy seaside hamlet than bustling oceanfront metropolis. Thick fog and bright sun can vary minute-to-minute, block-by-block, and July will always be colder than October. While inconceivably steep hills pop up everywhere, the streets remain surprisingly bikeable. One indelible trait about San Francisco is that it’s defined by its neighborhoods, each one with a distinct style, vibe, and subculture. Today, their modern identities maintain historical roots: the Castro’s groundbreaking role as a gay haven is still seen in the LGBT bars and represented by the Castro Theatre marquee; the Haight still bears the unkempt spirit of its hippie heyday; the beating heart of the Beat generation endures in the nooks and crannies of North Beach. Each place has changed with the times but holds onto its heritage. Despite its reputation as an innovation incubator, San Francisco’s architectural landscape has resisted the influence of the new guard, remaining uncharacteristically conservative, save for Herzog & de Meuron’s 2005 de Young Museum in Golden Gate Park. 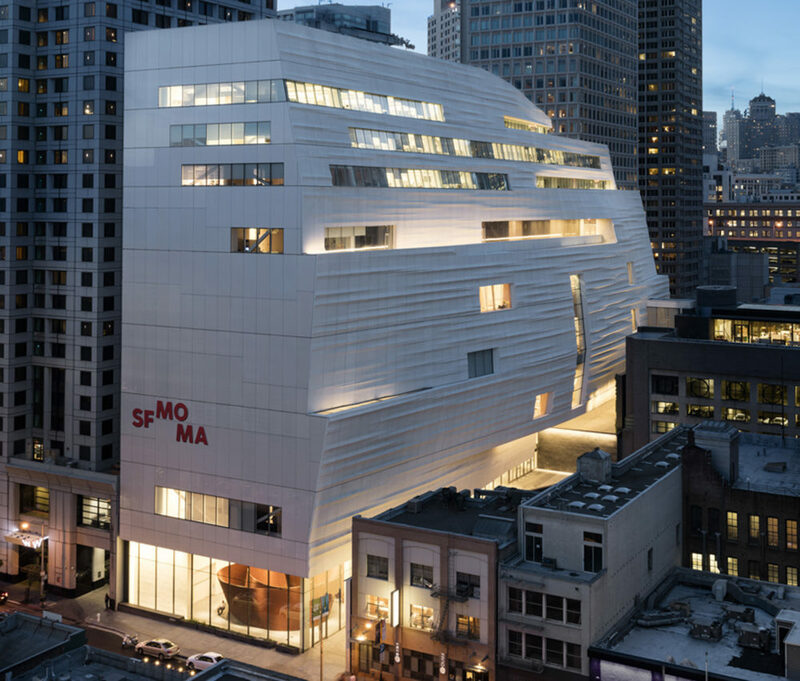 But the debut of Snøhetta’s SFMoMA this year marks a watershed moment. In the coming years, the city will welcome ambitious new arrivals to its skyline: Pelli Clarke Pelli’s glass-and-steel Salesforce Tower; the gyrating Folsom Bay Tower by Jeanne Gang; and a geometric skyscraper by OMA and local firm Fougeron Architecture. Change is happening on the waterfront too, as the derelict Hunters Point Naval Shipyard is set to be remade into a community of 12,000 homes by architect Jeffrey Heller, a project 20 years in the making. The city is grappling with an evolution that’s been more of a rupture than gradual shift. As always, opinions vary over the direction we’re headed. Even the way we eat has become a point of contention. As wealth pours in and rents skyrocket, restaurants increasingly cater to to an elite class with exorbitantly priced tasting menus and experimental haute cuisine. An existential debate rages on, but the character of this once staunchly crazy place lives on through the wanderers and weirdos who are determined to help shape its future. Just as it always has. 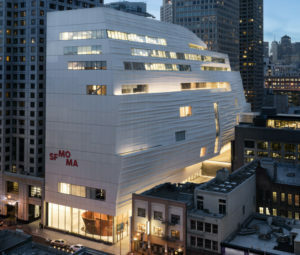 The art world’s attention was trained on San Francisco this May for the reopening of SFMoMA and Snøhetta’s unbridled 10-story expansion. Inside the rippling ice-white facade, which runs parallel to the original Mario Botta-designed building, is a surplus of new offerings, among which is Richard Serra’s monumental coiling corten steel “Sequence” (2006). It’s an impressive commitment to accessible art matched in heart—if not scale—in the Dogpatch district, where the Minnesota Street Project has been a windfall for the creative community facing exorbitant real estate prices. 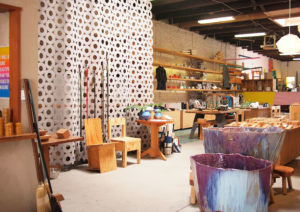 Three warehouse woodshops, refit by Jensen Architects, are now home to affordable studios, galleries, and open exhibition spaces, generally designated for shows of contemporary art featuring promising newcomers among a few established names, including Houston-based artist Mark Flood, who has a show up this month. In the Mission District, the historic Redstone building houses one of the city’s most radical concepts: The Lab. The nonprofit commissions local artists, who specialize in a wide range of media, to fill the space as they wish. Visitors will encounter everything from sound installations to performance art to this month’s “Hearing Voices” by Dora García, an audio series on the Anti-psychiatry movement of the 1970s. 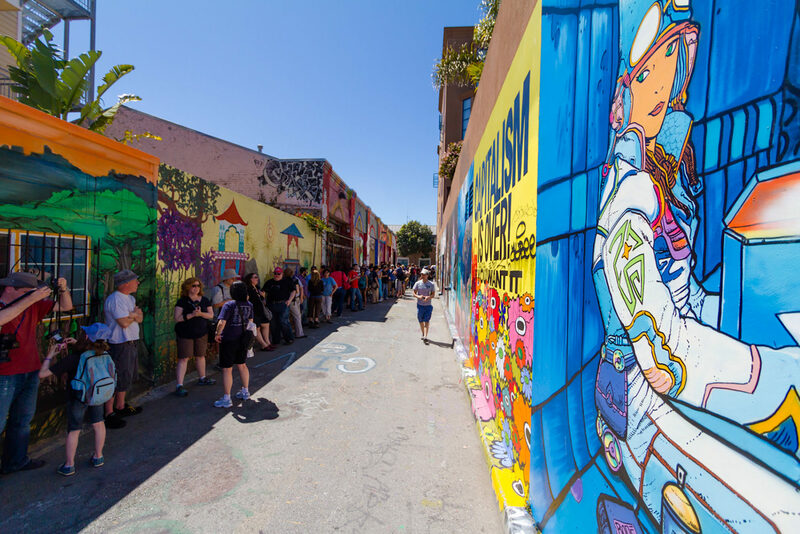 Though the Mission has been largely buffed clean of its history, the vibrant street-art corridor Clarion Alley still offers a glimpse into nearly 25 years of social and political activism through painting. The highly anticipated Frank Stella retrospective, the first in the U.S. since 1970, arrives on the West Coast at de Young Museum this month, its final stop following a stint at the Modern Art Museum of Fort Worth and its debut at New York’s Whitney Museum of American Art in February. The striking oxidized copper facade by Herzog & de Meuron and Fong & Chan Architects has become an icon in Golden Gate Park since its 2005 inauguration, particularly the twisting, 144-foot tower that affords sweeping views of the surrounding landscape. Wattis Institute for Contemporary Arts director Anthony Huberman has earned high marks since taking the reins in 2013 for putting on unconventional shows in the Potrero Hill space also designed by Jensen Architects. Meanwhile, in downtown Berkeley, the Berkeley Art Museum and Pacific Film Archive took over a 1930s printing facility, commissioning Diller Scofidio + Renfo to update the structure. The birthplace of the farm-to-table movement has, in recent years, been at the center of a wide-ranging debate over the plutocratic debasing of what began as a democratic principle. Yet risk-taking chefs keep pushing the limits of creativity in the kitchen. 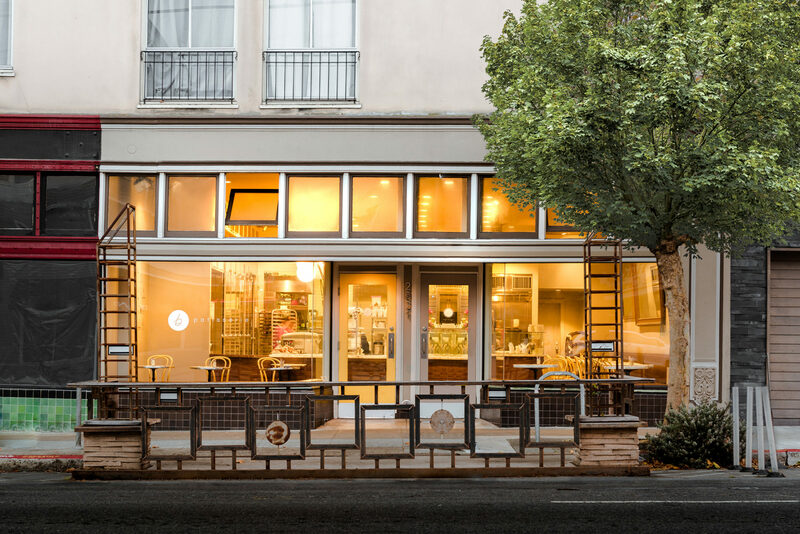 At The Perennial, in the Mid-Market neighborhood, the gospel of sustainability is given a new chapter. The founders of the beloved Mission Chinese and Commonwealth, Karen Leibowitz and Anthony Myint, along with chef Chris Kiyuna, employ a radical approach to the production of everything from bread, which they make with a perennial grain called Kernza, to the composting of kitchen scraps in an off-site aquaponics greenhouse. The restaurant is outfitted with chairs by Paul Discoe, who sourced most of the cypress and black acacia from the former Transbay Terminal, along with hand-glazed Fireclay Tile. A former garage with vaulted ceilings and rough-hewn cement walls is the setting for Cala, a modern Mexican spot in Hayes Valley. It’s the first U.S. venture from owner and chef Gabriela Cámara, whose Contramar is an institution in Mexico City. Architect Charles Hemminger offset the bright white interiors with black pendant lights by Colectivo 1050 ̊ and green kangaroo vines. 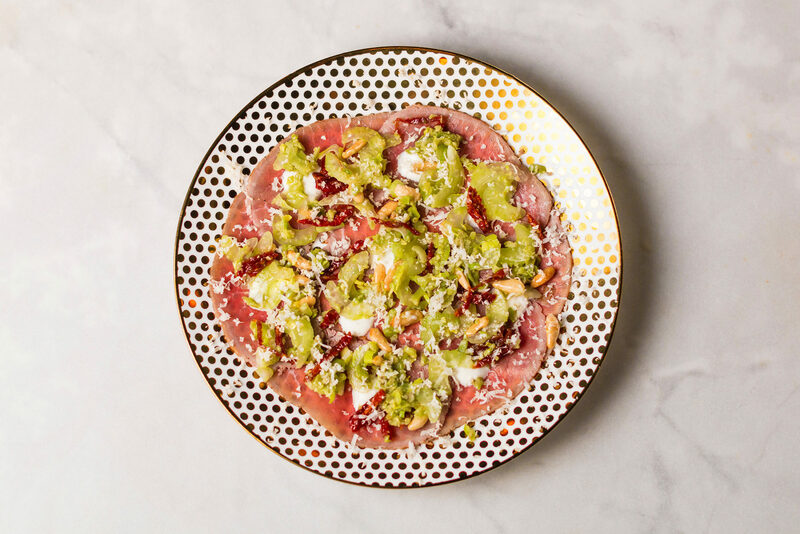 Cámara’s sophisticated takes on classic dishes are served in the main dining room, but the restaurant also satisfies grab-and-go burrito culture with a back-alley taco stand. 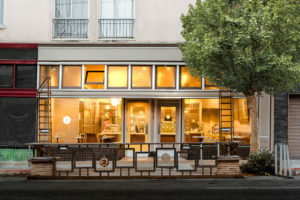 Situated on the once sleepy end of the Mission’s bustling Valencia Street, Tawla pairs Eastern Mediterranean food like muhammara and musaka with drinks from star cocktail crew The Bon Vivants. The Arabesque design—patterned latticework, an art installation of Turkish coffee cups—is the work of Minnesota-based firm Cmnd+M. In Fidi, the Ken Fulk-conceived Leo’s Oyster Bar offers a tropical take on midcentury glamour (think: Beverly Hills by way of Miami). 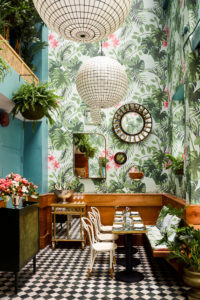 The space is done up in custom botanical wallpaper and a pink onyx bar, with a discreet terracotta-lined lounge in the back serving bowls of rum punch. A prodigious black-and-white photo of chef Ravi Kapur’s mom hangs behind the bar at Nob Hill’s Liholiho Yacht Club, which pays homage to his Hawaiian heritage with dishes such as tuna poké and beef tongue buns. A protégé of Renzo Piano, architect Brett Terpeluk outfitted the space with blue octagonal tiles, exposed brick walls, and blond wood tables. The just-opened subterranean bar, Louie’s Gen-Gen Room, is getting praise for well-executed drinks infused with tropical notes. The award for the most imaginative new cocktail spot, though, goes to Whitechapel, in the Tenderloin, a recreation of the Victorian-era London Underground station with a menu devoted entirely to gin. Designer Ignacio “Notch” Gonzalez’s period language includes retro drain covers, a bar outfitted with subway tiles, and a barrel-vaulted ceiling. After tearing up the rule book at his three-Michelin-starred Benu, chef Corey Lee’s encore might be even more renegade. At In Situ, he crowd- sourced recipes from the world’s great culinary minds like Noma’s René Redzepi, serving them inside a ground-floor space at SFMoMA. The design by Aidlin Darling is a case study in amplifying blond wood elements, with Herman Miller furniture and colorful local artworks. Airbnb has become an ubiquitous—and controversial—presence in San Francisco, which has long been plagued by a deficiency of stylish places to stay. But a few newcomers are showing off an elevated design eye. New York’s Hun Aw Studio restored a historic 1909 art deco building just off centrally located Union Square, giving it new life as Hotel G. Original elements like hexagonal tile floors and a cast-iron staircase in the lobby were left intact, as were the brasserie’s rough-hewn pillars and exposed ceiling. The 153 rooms are pared-down, with tufted denim headboards, Victorian settees, and vintage banker’s lamps. Nearby, the LEED-certified, 152-room Axiom Hotel nods to the city’s famous cable cars with crisscrossing lights and chrome ropes. New York firm Stonehill & Taylor is behind the interior design, which features a soaring double-height lobby with a dramatic lighting fixture made of cables strung with bulbs and glitchy pixelated artwork. The lounge is an ode to Andrew Hallidie, with tchotchkes and books that reference the 19th-century cable car inventor. For its foray into the Bay Area, Viceroy Group debuted two sister properties by Seattle firm Dawson Design Associates. The 196-room Hotel Zeppelin pays tribute to the city’s counterculture history with vinyl record players, midcentury lamps, and psychedelic wallpaper inscribed with the names of famous bands. Graffiti artists Color Cartel’s lobby bar art is illuminated by blacklight, while the gin bottle-filled metal cage is a throwback to the speakeasy that once inhabited the space. Set in a neoclassical SoMa building, Hotel Zetta’s eco-consciousness is revealed in salvaged materials and artworks, including portraits made of repurposed floppy discs and chandeliers crafted with recycled eyeglasses. The 116 rooms are appointed with modular butcher-block desks and Cheng Meng sofas. 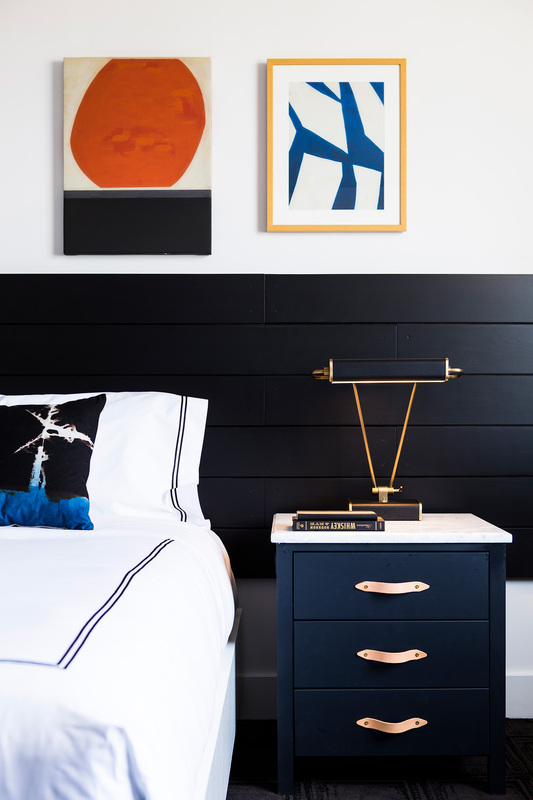 The city’s strong connection to Asia is represented at Japantown’s 131-room Kimpton Buchanan, designed by Nicole Hollis. The interiors are awash in Japanese touches: a lobby wall composed of charred whiskey barrels, a finishing technique called shou-sugi; Kimono robes and Shibori-patterned pillows. At Workshop Residence, Ann Hatch’s studio in the Dogpatch, a new designer-in-residence cycles through every two months to moderate talks, lead customers through the design process, and produce limited-edition objects for the shop. Past participants include Max Lamb, Johanna Grawunder, and fashion designer Aurore Thibout. Edith Heath’s vision for her eponymous ceramics brand lives on in its original Sausalito factory from 1948, as well as a newer Mission outpost, which combines a factory, cafe, and store. Expect a colorful range of midcentury homewares, which earned the company a National Design Award from Cooper Hewitt, Smithsonian Design Museum in 2015. The city’s style definitely tends toward the casual, and the unofficial menswear uniform is best sourced at Unionmade, where the shelves are stocked with classic denim and Jack Purcell shoes. At the sister store The Mill Mercantile, Dieppa Restrepo brogues and workwear-inspired separates are a small sampling of the assortment. Jenny Chung’s No. 3 offers an impeccable selection of jewelry and adornments from designers like Gas Bijoux, Miansai, and Zoe Chicco in a small Russian Hill boutique. North Beach’s Eden & Eden carries an eclectic range of tablewares, design accessories, and custom-printed tees edited by the graphic-designer owner. Former Vogue editor Emily Holt used cult boutiques like Chicago’s Ikram and Colette in Paris as inspiration for Hero Shop in the Tenderloin. On display: contemporary brands Creatures of the Wind and Of Rare Origin, as well as local label Tatcha. One of the reasons I chose the Tenderloin as the location for my current gallery space is because of its rich cultural history. Two sites I love visiting in the neighborhood are the Tenderloin National Forest and the year-old Tenderloin Museum. Just the other day, I came across an impromptu performance at the edge of the National Forest, a reclaimed alley planted with greenery. Afterwards, I strolled a block down Leavenworth for a peek into the museum, which offers an in-depth history of the neighborhood along with excellent programing, including some film screenings. American artist David Ireland’s house in the Mission is newly reopened as 500 Capp Street thanks to the vision of director Carlie Wilmans. Make sure to book in advance to secure a tour. I recently visited the house after Architectural Resources Group and Jensen Architects renovated the space. It was a real treat! Pastry chef Belinda Leong is a San Francisco native, but brings her international experience to B. Patisserie. The kouignamann is her signature item with seasonal flavors changing frequently. Lighter and not-so-sweet, her pastries are perfectly balanced. La Palma is an iconic ‘mexicatessan’ in the Mission District that sells both grocery items and made-to-order Mexican food. They’re known for their tortillas that supply many restaurants in the city, but the fresh salsas, guacamoles, and carnitas shouldn’t be missed. Mister Jiu’s is a new favorite—one of the first restaurants in San Francisco to redefine modern Cantonese cuisine. Boor Bridges Architecture restored an old Chinatown banquet hall built in 1880, but kept the original lotus chandeliers and Lazy Susan tables for the family style tasting menu by Brandon Jew, a former Bar Agricole chef. There’s a lot of great energy in the local art scene these days. Larry Gagosian has expanded his empire with a new San Francisco gallery just across the street from SFMoMA. The space, in the historic Crown Point Press building, is filled with natural light and was designed by Kulapat Yantrasast of Why Architecture. I love taking my out-of-town guests to enjoy some of SanFrancisco’s best microbrews. Harmonic is a new brewery in the Dogpatch that not only serves fantastic beer, but is attached to Shop Floor, a furniture showroom and metal fabricator that features limited-edition pieces from local and national designers.